Please welcome the newly elected 2018 TC Motoring Guild Executive Council! Your new Executive Officers are Curt Sorensen, Mel Appell, Sandra Loe, Joyce Edgar, Steve Simmons, Lucy McCanne and Richard Loe. Additional club chairs are currently operating as they did throughout 2017, and may change in January. Thank you to everyone who gives their time to keep our club running smoothly! To learn more about these awards, including the various ways the breakdown award has been won, see the History Section of the web site. Richard and Sandra Loe have just achieved a fourth consecutive year of perfect attendance, and are now 4-time Iron Bottom awards recipients. That means they have not missed a single TCMG event or meeting WITH THEIR TC in four years! Congratulations to the Loes for this amazing and unprecedented feat! In this video taken at our 2017 Annual Meeting and Holiday Party, we see Ron Simon receive an achievement award from TC Motoring Guild in recognition of his many years of dedicated service to the club. At our next monthly meeting on January 23, the crowd favorite returns with your award-winning (through cheating) host, Gene Olson! 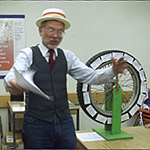 Teams will compete for fabulous prizes (or not) by spinning the wheel and answering trivia questions. Look for the TC in the parking lot with one wheel missing and you’ll know you’re in the right place! December Recap: 45 members and guests enjoyed our Annual Meeting and Holiday Party. Thank you to all the volunteers who helped put together another memorable evening! Start off the new year with a thrilling, no holds barred TC Motoring Guild miniature golf competition! The winner takes home our coveted Lame Duk Kup Trophy, to be treasured for one whole year. Lunch and awards will follow at the nearby Robin Hood British Pub. Meet on Saturday, January 41 (aka February 10) at Castle Park in Sherman Oaks at 9:00 AM, located near the 101 & 405 freeways. Our competition begins shortly after we arrive. Price per person is $3.00 for one 18-hole round. For more information see the January / February newsletter or contact Steve Simmons. The January / February Midget Chassis is online and ready for viewing. Click here to view. April 27: Updated page for Richard and Sandra Loe with new TC information. March 28: New page added to the History Page about our trip to big bear in 1959. January 19: New content added to the Links Page.